In co-operation and with the support of the Holy Metropolis of Veroia, Naoussa and Campania. 19.30 Professor Georgios Mantzarides (School of Theology, University of Thessaloniki): Hesychasm as an expression of the Orthodox Patristic Theology in the work of St Gregory Palamas. 09.15 Professor John Farina (George Mason University, USA): Implications of Gregory of Palamas’s Thought for Christian Social Teaching. 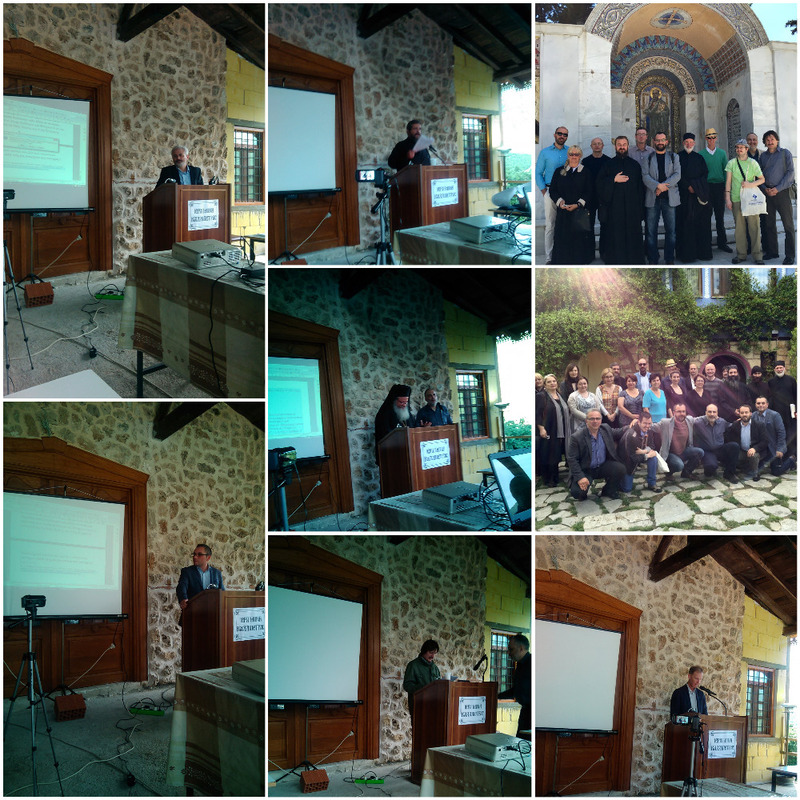 10.30 Professor Reverend Fr Nikolaos Loudovikos (University Ecclesiastical Academy of Thessaloniki): Anti-Palamite Criticisms by Modern Orthodox Theologians. 11.15 Dr. Viorel Vizureanu (University of Bucharest, Institute of Philosophy and Psychology C. Radulescu-Motru of Romanian Academy): Dumitru Staniloae’s Recovery of Saint Gregory Palamas’s Thought and its Significance for the Romanian Spiritual Space. 12.00 Fr Marian Vild (Romanian Academy-Iași Branch): Principles of Biblical Exegesis in the Homilies for Major Feast Days of St. Gregory Palamas. 13.45 Dr Theodoros Chrestou (Queens University, Canada): Philosophy of Education in the work of St Gregory Palamas. 14.30 Professor Georgios Panagopoulos (University Ecclesiastical Academy of Ioannina): The two kinds of seeing God in St Gregory Palamas' Refutation Oration against Akindynos. 15.30 Dr Anna Palusińska (John Paul II Catholic University of Lublin): Gregory Palamas' and Duns Scotus' Conception of God. 16.15 Fr Manuel Summares (Faculdade de Filosofia de Braga- UCP): Saint Gregory Palamas’ Critique of ‘Mind-out-of-Body’ and Its Contemporary Recovery in the Radical Phenomenology of Michel Henry. 17.00 Dr. Constantinos Athanasopoulos (Open University, UK): Hesychasm as a form of life in the work of St Gregory Palamas and its relation to L. Wittgenstein's views on quietude. 11.00 Dr. Mikonja Knežević (University of Pristina and Kosovska Mitrovica, Montenegro): The Essence-Energy Structure in the Works of Gregory Palamas and the Question of “Metaphysical Platonism. 11.45 Fr Liviu Petcu (Romanian Academy-Iași Branch): The Reception of Saint Gregory Palamas in Romania. 12.30 Dr. Krzysztof Korżyk, (Jesuit University Ignatianum in Krakow): The Symbolic Realism of St. Gregory Palamas’ Doctrine from the Perspective of the 20th Century Dispute over Onomatodoxy: A Fresh Look. 13.45 Dr. Spyridon Panagopoulos (Ionian University): The Relationship of Saint Gregory Palamas’ Theology of Transfiguration and the Hesychast Iconography of 14th- 16th c.
15.30 Dr. Savu Totu (University of Bucharest, Romania): About Faith in the Homilies of Saint Gregory Palamas. 16.15 Professor Mihai-Dan Chițoiu (Romanian Academy-Iași Branch): St. Gregory Palamas` ‘Appeal to Experience’ as a (Radical) Phenomenology? 17.15 Dr. Zaharia-Sebastian Mateiescu (University of Bucharest and University of Lausanne): St Gregory Palamas’ distinction between ‘natural’ and ‘supernatural’ participation in God. Early morning departure from Veroia for men participants for the visit to Holy Mt Athos (Holy Monastery of Vatopedi and other Holy Monasteries and Sketes at Mt Athos). Alternative programme for women participants. Return of the men from Holy Mt Athos to Veroia in the afternoon (with a short stop at the Thessaloniki Airport for the people who will depart on Thursday). Participation to the Pavleia Celebrations (for all who are interested, with a prior permission from the Holy Metropolis of Veroia- can be arranged while at the Conference).